I am posting this blog for and sending heaps of love out to my friends Krista and Bill. There are so many cancer treatment alternatives out there....sometimes chemo and/or surgery are the right choice. But that doesn't mean it is the only choice. In my years of research about this topic, I've found a few people that I think are very interesting. I've not worked with all of them. But I know that in certain instances, they work. I am posting about a very small number of them here. This is no endorsement of their services, just another avenue that can be explored. -"Choices in Healing: Integrating the Best of Conventional and Complementary Approaches to Cancer" by Michael Lerner, who is the founder of Commonweal, a health and environmental research institute, and also the Commonweal Cancer Help Program, which produced a landmark study on unconventional cancer treatments. This book is incredible. It offers so many suggestions and links you to many other health professionals dealing with any given cancer. 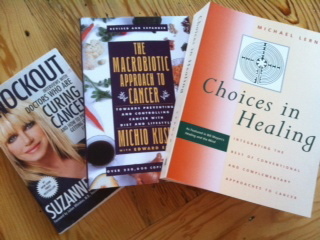 -"The Macrobiotic Approach to Cancer" by Michio Kushi, famous for bringing the Macrobiotic Diet to the United States. Their family still runs the Kushi Institute, where you can go to learn how to adapt a Macrobiotic lifestyle. -"Knockout" by Suzanne Somers, who interviews 4 doctors who are knocking out cancer successfully with alternative treatments, and 7 other doctors who have effective methods for preventing recurrences or cancer in the first place. It is a real eye-opener, and very worth the read. These books will give you many ideas. Some of the specific practices I mention below come out of these books, others from health professionals. Dr. Stanislaw Burzynski at the Burzynski Clinic They have had consistent success dealing with brain, breast, prostate, colon, lung, ovarian, and Hodgkin's lymphoma cancers. His technique is to supply the body with antineoplastons (peptides), which fortifies genes to eradicate cancer. Dr. Nicholas Gonzales, in New York City, who fortifies the body with enzymes that keep cancer at bay for up to decades. Individualized nutrition plans are also a major component of his work. Paul Beals, MD, from National Integrative Health Associates in Washington, DC, who combines traditional therapies with alternative ones, and advocates for toxic-free cures. The Raw Foods Institute, in Washington, D.C. teaches cancer patients how to radically change their diets with foods that have proven in countless cases to eliminate cancer, without any toxins whatsoever. The Kushi Institute in Becket, MA, is a remarkable haven with even more remarkable outcomes. Go to their website to hear the testimonials from patient who thought chemo wouldn't work and believed that was their last chance, but are now fully recovered after adapting the Macrobiotic lifestyle. Incredible.